With Halloween in the rearview mirror, my brain turns to the holidays. I love planning holiday meals and while we typically go 90% traditional, I like to occasionally throw something fun into the mix. Last year I shared three different full menus (vegan, vegetarian, + gluten-free)- this year I’m going a bit more low-key. To kick off November, however, I thought I’d share one of my favorite savory galettes. 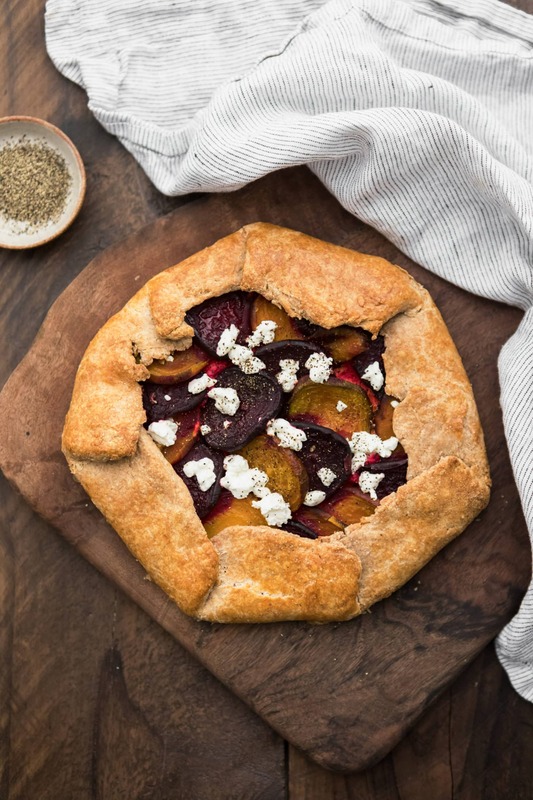 A beautiful vegetarian savory galette featuring multi-color roasted beets, creamy ricotta, and an easy wheat crust. To make the beets: Preheat the oven to 400°F. Peel the beets and slice into 1/4-inch (6-mm) slices. Toss with the olive oil and salt. Spread out into a single layer on a sheet tray or two. Roast until tender, 35 to 45 minutes. Meanwhile, to make the crust: In a food processor, combine the flours and salt. Pulse in the butter/cream cheese until the dough is in slightly larger than pea-size pieces. Pulse in 1 tablespoon of the water, and continue to add water and pulse until dough starts to come together. Remove from the food processor and shape into a disk. Wrap in plastic wrap and refrigerate for 20 minutes. To make the filling: In a medium bowl, mix together the ricotta, rosemary, salt, garlic, and egg white. On a surface lightly covered with flour, roll the dough out to a 12- to 14-inch (30- to 35.5-cm) circle. Spread the ricotta mixture evenly over the crust, leaving a 2-inch (5-cm) edge. Layer the beets evenly in a circular pattern, covering the ricotta. Fold the edges of the crust over the outer edge of the beets, pleating as needed to make an even circle. (The center of the galette won’t have any dough over it.) Brush the olive oil over the beets. Combine the egg yolk with the heavy cream or water and brush the outer edge of the crust. Bake for 40 to 45 minutes, until the crust is golden brown. Allow to cool slightly and sprinkle with goat cheese and black pepper before serving. 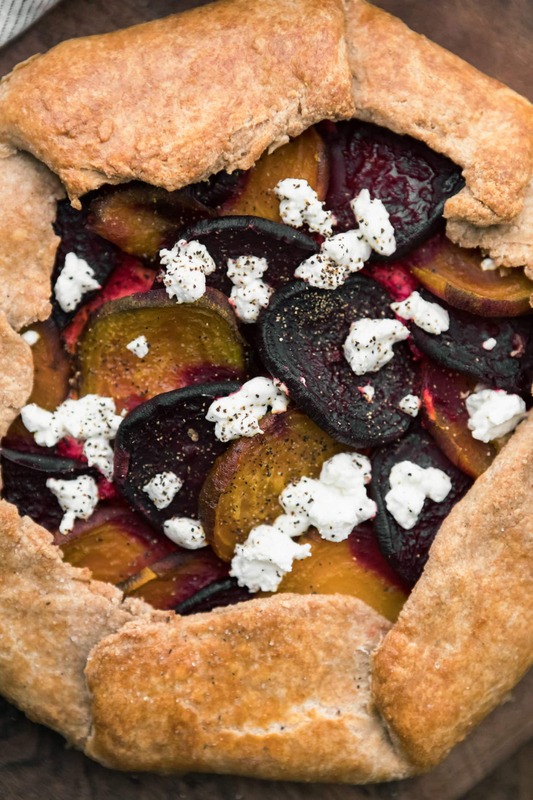 Tips & Tricks: Roast the beets and make the pastry dough up to 48 hours before assembling the galette. I typically make a galette when I need a beautiful vegetarian dish that I can wow people who aren’t meat-eaters. Usually the idea of eating a savory pie is intriguing plus it’s easy to adapt the recipe to the taste of who you are serving. Vegetables: Beets are just the beginning. Try using other root vegetables like parsnips or rutabagas. Sweet potatoes and squash are also delicious choices. Cheese: If goat cheese isn’t your favorite, try a sprinkle of feta or just leave the goat cheese off the top. Crust: I like swapping 1/2 cup or so of the wheat flour out for rye flour. The added flavor is a lovely compliment to the root vegetables. While I love grinding my own flour at home, I also like having a solid store-bought flour that I can use (and recommend!) 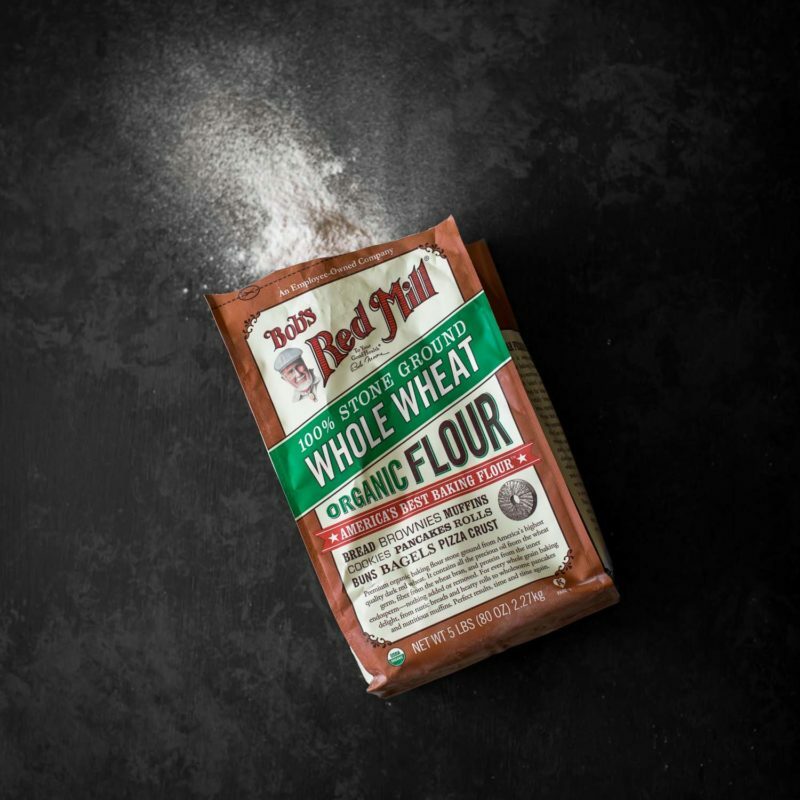 I love Bob’s Red Mill flours- their whole wheat is really lovely in savory dishes and the all-purpose is perfect when I need to add a bit of lightness to pastries. 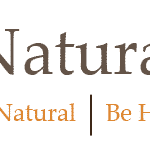 There is no arrowroot or cornstarch amounts listed in the ingredients! How much of each should be used? Please reply to [email protected]. None- it’s just flour and salt so I updated the recipe. Love roasted beets! This is a must try for me. Thanks for sharing! i want to make this gluten free. Can I just Bob’s gluten free flour? Or can I make substitutions with other flours? The directions are missing when the cream cheese is added to the crust. I was wondering why I forgot it! I’m going to spread it inside now, since I’m winging this without ricotta cheese. Thanks for the inspiration. Just caught that and updated- goes in the crust but sounds like it worked for you in! I don’t see when to add the cream cheese to the crust. It’s listed in the ingredients but you don’t mention it in the preparation? Should I add it with the butter? Updated- it does go with the butter!